I want to be Nathan Drake, a sniper on a tightrope, fingertips that grip better than steel claws, a modern swashbuckler who's parlayed the half-tuck from design band-aid to video game vogue. He's wittier than I'll ever be, far better looking without a shave, and the playable linchpin in Naughty Dog's Uncharted 2: Among Thieves, the PS3-exclusive sequel to acclaimed 2007 action-adventure Uncharted: Drake's Fortune. 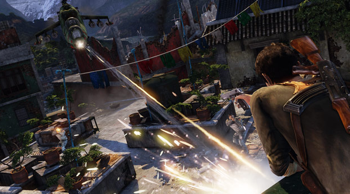 Uncharted 2's out on October 13th and the multiplayer demo launches this week, so we caught up with Naughty Dog co-president Evan Wells and creative director Amy Hennig for an over-the-shoulder peek at the design process. 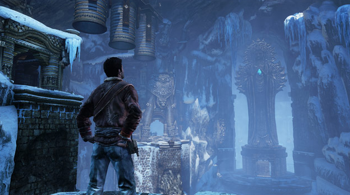 Game On: Where did the concept for Uncharted come from? I mean aside from the obvious sorts of genre things like H. R. Haggard or Treasure of the Sierra Madre? Amy Hennig: I think it was a couple of steps. We knew certain things going in. We knew we wanted to stay in the third-person action-adventure genre because it's one we love and know how to do well and wanted to explore even further. We kicked around different ideas of what kind of play space that meant. I think it just came out of some conversations that we had, where as we were thinking about some of these different iterative possibilities, we latched onto the idea that this was really an untapped genre. That traditional action-adventure genre, going back to all of the old adventure comics. Your Tintins and your old adventure serials and your old movies like Gunga Din and stuff inspired by H. Rider Haggard. There's this huge tradition that games really, ironically haven't drawn on. They've drawn a lot on space opera, they've drawn a lot on Lord of the Rings and Dungeons & Dragons tropes. Once we started doing a bunch of research, we watched lots of movies, and I actually deconstructed the genre down into a bunch of bullet points, saying here's the thing we see over and over and over again, and here's how it would translate into a game. For me it was like a light bulb going on, like "Yeah, we can do this," and it was funny how it gave us our path from then on. We were saying "Now we know exactly what we need to do, we need to figure out how to make a relatable hero, how he's going to seem human and not like just another game avatar." Evan Wells: One of the things that steered us in that direction was that we spent, I don't know, six or nine months coming up with different ideas, but the actual PlayStation 3 hardware was a major factor. We said okay, for the first time we've got the power to do something that's completely real. We wanted to do something that was modern day and current, and so that weeded out some of the other ideas we were considering, and steered us towards the action-adventure genre. AH: And humor's hard to do. That's kind of scary to launch into and say okay, we're going to pull this off. It's so subjective and it can fall so flat if you do it wrong. It was trying to make the guy a relatable hero that wasn't going to animate the same way every time. Just picking the genre ended up requiring that we create this whole proprietary animation system for Drake and the other characters, primarily where we could see him flinch, and stumble, and curse under his breath, and be able to run through a clearing under gunfire, and be loading his gun as he's tripping over the terrain and trying to dive into cover, and to not see the same animations play out again and again and again. We knew it had to be this complex rugged animation system that made him seem like a real guy. EW: We're very driven by technology here. We sort of pride ourselves on taking full advantage of the hardware that we're working with. We wanted to pick something that would challenge us and put forth something that wasn't commonly done in games. We literally stripped our character down to a t-shirt and jeans, which is technically the hardest thing to do because your character is more or less naked when you're comparing him to these guys that are running around in rigid armor. The latter's much easier to render and much easier for the artists and programmers to create. When you're actually dealing with skin and cloth and hair though, it's a much greater challenge. AH: It's the subtlety of what Drake expresses on his face, all the emotions and things like that. Again, it goes back to the storytelling. We knew we didn't want to tell a story that had to be told through explicit exposition just because we couldn't rely on subtlety and nuance in the characters' expressions. So we had to develop this very complex facial rig so that you could infer something from the cut of a character's eyes and no dialogue. 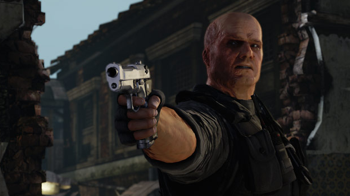 It's something of course you count on when making a film with flesh and blood actors, but in games we haven't been able to rely on that, so we tend to be very heavy handed. We actually tended in the past to write games more like they were radio plays because we couldn't count on the visuals to convey nuance. Now we can, and that's one of the things that's exciting about Uncharted 2, even more so than the original. There's lots of cases where you can infer things about the characters when they're not even speaking. GO: I've already seen some of that in the interaction between Drake and Harry Flynn early on. AH: One of the things people aren't even that aware of is, we get a lot of reactions from people who say "I can't believe the game predicted how I was reacting to something, how Drake might say something right when I was thinking it." One of the things we do, and we did it more in Uncharted 2 than in the last game, is, we always have the actors performing together, whether it's on a motion capture stage where we're recording their entire performance, dialogue included, or whether it's in the voice studio, we get them in there together if their scenes are together. I take gameplay footage and put it up on the screen and they basically watch the entire game. So they're watching the gameplay footage, and talking over it back and forth. There's a huge amount of improvisation in the game. I mean obviously it's written too, I don't want to take credit away from ourselves, but a lot of it's improvisation on the actors' part. They're reacting to what's happening to their characters, and a lot of that banter between them is just them riffing together cold. That's why it seems so natural. AH: [Laughs] That's a great example. Now obviously I write everything first, but when we go into the studio, we work together for over an entire year, so our voice actors are as invested in the characters as we are and know them as well as we do, so it's like working on a TV series rather than a game. What usually happens in games is the voice actors come in, they have no idea what's going on in the script, they come to the studio for a couple of weeks if they're the main character and read a whole bunch of stuff off the copy stand in the voice studio and that's it. Here, we work with them as collaborators, so when we go in to record any of the things that require mo-cap, we have a rehearsal first. We rewrite the scripts together, we revise them, we block it out on the stage as if we were doing a stage play or a film, and then we revise again. We play with different ideas that come up right then and there, and then on the day we shoot, we even improvise some more and try things different ways. A lot of that immediacy and the organic nature of the dialogue comes out of that process. GO: I'd give that design anecdote of the year. AH: You have to be open to the fact that it's a collaborative process, and that's one of the things that defines Naughty Dog in general. We're a studio, completely non-hierarchical and collaborative. One of the reasons a lot of the stuff in the game is such high quality is that we're very non-compromising. We're very honest with each other. If somebody's work is subpar, we say "You know what, that joke wasn't funny, can we take it out," or "The background doesn't look very good, we need to improve it," or "This mechanic isn't entertaining, we have to fix it." And the same thing applies to what we do with the actors on stage. I'll take a script in and we'll tear the whole thing apart, change it, fix it, if we don't feel collectively that it's up to snuff. The actors know they can contribute and say "What if we did this instead?" without any sort of egos. You know, check your egos at the door. I think that's really rare, unfortunately, in game development.